The dirt paths and roads in this area are great for running, walking, and off-road biking. 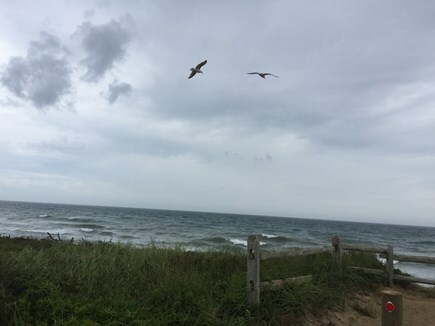 Cisco Beach, at the end of Hummock Pond Road, is noted for its very soft sand and its vigorous waves and strong surf. The Mass. Audubon Society (153 Hummock Pond Road) occupies about 900 acres of conservation land. Research and sanctuary staffs maintain and study a wide variety of vegetation. The Nantucket Community Garden (166 Hummock Pond Road) offers local residents plots for growing vegetables, herbs, and flowers and a greenhouse for preseason plantings. Miacomet Beach can be reached by going to the end of Miacomet Road or South Shore Drive; both are dirt roads for the final stretch. This beach has heavy surf and very strong currents. A lifeguard is posted in one area of this long beach. 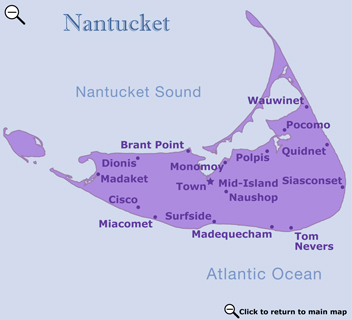 Other noteworthy attractions are the Miacomet Golf Club with its natural setting and views of the open ocean; Miacomet Pond, a freshwater pond with a beach and a birding area; and Cisco Brewers and Nantucket Vineyard winery. Bartlett Farm is a very popular spot with residents and vacationers alike. Consisting of more than 100 acres of land (two acres of greenhouses alone! ), this farm sells fresh produce, baked goods, prepared foods, and flowers.